In case you forgot about Friday’s matchup, Michael the Archangel defeated Anna the Prophet 53% to 47% to advance to the Saintly Sixteen where he’ll face Esther. Finally, in the shout-out department, we’re pleased to share an article titled St. Albans Participates in Lent Madness that appeared in the Eureka-Times Standard. Congrats to the Rev. Nancy Streufert and the folks at St. Alban’s Church in Acarta, California! Lent Madness is HUGE in the Redwood forest. Isidore was a prodigious farmer who credited the wealth of his harvests to angels who worked by his side. Born in Madrid, Spain, in about 1070, Isidore was a poor laborer for Juan de Vargas, a wealthy landowner. While Isidore spent his life working the land for others, he was always generous, sharing all he had with the poor. Saintly lore tells us that Isidore is credited with more than 400 miracles. In addition to bringing an abundance of agricultural bounty for the de Vargas family, Isidore also is said to have brought de Vargas’s daughter back to life. Another story tells of a beggar who arrived at Isidore’s home seeking food. Isidore’s wife, Maria, told the beggar that there was no more stew in the pot. As the beggar turned away, Isidore called out to his wife to check again. On further inspection, the pot of stew miraculously refilled. Legend also recalls that after Isidore and Maria’s only son fell into a well, Isidore prayed that the waters would rise and his son would be saved. The waters responded to his prayers, and Isidore’s son was rescued from drowning. According to another legend, fellow farmhands complained that Isidore was always late for work because he went to worship first. The master investigated and found an angel plowing the field while Isidore was praying. The story of Isidore the Farmer teaches us about the holiness of hard work and the value of labor. Through Isidore’s witness, we see that real abundance is not found through monetary wealth; dignity and holiness can be discovered in an ordinary life dedicated to God. Through our labors, we can also find a relationship with God as the toil of our hands takes care of our fellow humans. According to legend, a flood nearly one hundred years after Isidore’s death uncovered his body, which was found to be in a state of incorruptibility, meaning it had not undergone normal decomposition. The church has viewed incorruptibility of the body as a sign of sainthood. 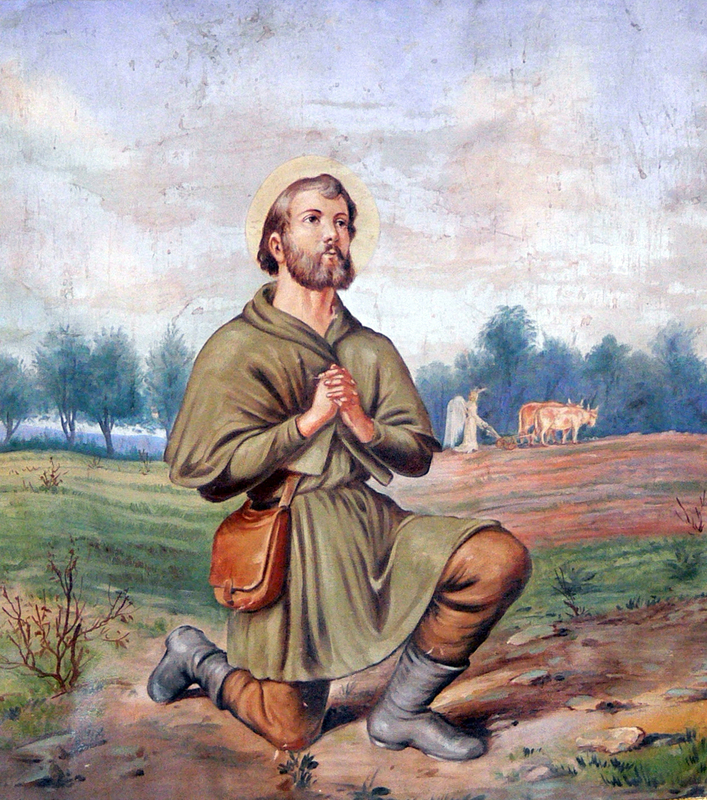 Isidore the Farmer, the patron saint of farmers and laborers, is celebrated on May 15. God of harrow and harvest: Look with favor upon us as we work wholeheartedly in our ministries that we, like our brother Isidore, might plow alongside unseen angels, find our dinner tables laden with enough to share, and joyfully work toward making your kingdom come on earth; we pray this in the name of the Great Sower of Seeds, Jesus Christ, your son. Amen. While our spiritual imagination may draw us to Eden or Gethsemane when we think of gardens, it is quite possible that the small garden of Phocas best illustrates the call to self-sacrificing love given to disciples of Jesus. Phocas’s garden was part of his first-century, modest, hermetic life outside the gates of Sinope, a town on the southern coast of the Black Sea. The garden was Phocas’s livelihood and his ministry. He lived by selling produce, while also using the garden’s abundance to feed the needy and hungry. At the heart of Phocas’s generosity was his Christian faith, which he sought to share with others just as fully as he shared food from his garden and resting places in his home. During the Diocletian Persecution, Phocas’s acts of generosity drew scrutiny from the authorities. Soldiers were sent with orders to kill him. Arriving at Sinope, they found the city gates closed. Seeking lodging, they ultimately came to the hermit’s home, where they asked for his assistance in tracking down their target. Without revealing his name, Phocas did for the soldiers what he did for all guests: he received them, fed them from his garden, and gave them shelter in which to sleep in his home. He promised to lead them to the man they sought in the morning. As they slept, Phocas dug a grave for his burial in the midst of the garden and made arrangements for the distribution of his goods to the poor. In the morning, Phocas revealed his identity and charged the soldiers to fulfill their duty. The soldiers, shocked by the act of hospitality shown by the one they were charged with killing, begged Phocas to recant his beliefs, allowing them to report a fruitless search. It was only when Phocas proclaimed that it was an honor to share in the sufferings of Jesus that the soldiers carried out their charge. Phocas was buried in the midst of his own garden, the place where he had provided unremitting hospitality to friend and enemy alike. Almighty God, you emptied yourself to take on the form of a servant, and you call your disciples to do the same. Kindle in our hearts the same love you bestowed upon Phocas the Gardener, that, in giving of our abundance to serve friend and enemy alike, we may reflect to the world around us the abundant generosity you show to us in your Son Jesus Christ, Our Lord, who lives and reigns with you and the Holy Spirit, one God, now and for ever. Amen. 166 Comments to "Isidore the Farmer vs. Phocas the Gardener"
A bit early to declare a trend – I am picking Isidore to go two rounds! I like that angles worked for Isidore so he could worship. Tough choice as both leave us with shining examples of hospitality. However, Phocas brought new meaning to the words “love your enemy”. I agree. I had a tough time choosing as well, but the part of his kindness towards those that would seek to do him harm was the swaying factor for me. I agee. Also, he refused to disavow his faith. Both seem nice, but Phocas reminds me of a friend who spends her summer caring for a huge garden that provides food for folks she knows who are on fixed incomes with the surplus going to a local charity. Rather than Community Supported Agriculture, she has Community Supporting Agriculture, like Phocas. I grew up across from a large farm and spent many of my spring and summers playing with friends around the farm and helping to care for the animals. I have always wished to have angels to do my work while I am praying (hasn’t happened yet, but I am still praying about it) and I love beef stew. So, my choice this morning was easy. Isidore may not make it through this round, but he has my vote this morning. Ouch, tough choice. God’s mercy and goodness has a unique form for each one. Both these saints brought Him glory. I picked Isadore, but as John says, it’s early yet. Very difficult to choose between the two as their messages of sharing the abundance of the earth under all and any circumstances are so similar, so boo to having to choose. 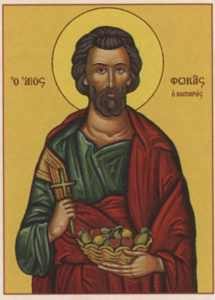 However, Isidore’s story feels to be a collection of very ancient folk motifs about the ‘cauldron of plenty’, being assisted by otherworldly helpers etc, whereas Phocas seems instead so deeply human and to be a true example of walking in the ways of Christ in the world. I have voted for him. A brave and good man indeed. Exactly my thoughts as well Bee. Thank you. Perfectly expressed. I was drawn by Phocas’s deep faith and refusal to recant. Phocas for me. I hope he not only wins but makes the Elate Eight. Those stories about Isidore, though, are almost certainly ways of recounting his very real generosity and hard work, and the way God was glorified in his life. So they’re not just fairy tales, even if they’re not literally historically accurate! I’m really deeply impressed by Phocas, but I’m also moved by the ordinariness of Isidore’s story (once you get past the miracle stories). Since I grew up working-class and my family were farmers and laborers, Isidore has my vote! I believe that any farmer who protects the earth and feeds the hungry is a blessing. Phocas lived to love thy neighbor. Try again in a little bit. Probably the server was busy. No angel to look after it! If when you go to try it acts like you already voted, you’re good. Ruth, I’m not sure about that as on a couple of occasions I have tried to vote and have been told I already have which has not been the case. Isidore’s story seems to be mostly tall tale; I think Phocas seems more real and human, and as such, a better role model and exemplar. Oh, an easy-peasy Monday vote between a farmer and a gardener. Oh, insidious tricksters! However, I was taken by the phrase, “plowing alongside unseen angels,” and chose Isidore. For some reason, the flowing scarf of Isadora Duncan figured in. Maybe I should go back to bed! I voted for Isidore. Just wonder if God really wanted Phocas to reveal his identity to the soldiers. I think you’ll find your answer to that question in Jesus’ words recorded in Matthew 10:33. I voted for Phocas because he faced death with the same fervor he had for life. True Christian message of loving all, even those who persecute you. Today we need more examples on how to serve both our friends and our enemies. Phocas exemplified Christ’s admonition to love your enemies. His bold act is a challenge to me to put my beliefs into actions. As a gardener myself, who loves all things of the earth, this was a bit tough, but I couldn’t resist Phocas’ kindness to his enemies. Wonderful soul! My husband from Madrid tipped the scales for me. Interesting Day. Not only are we voting on two saints who were toilers of the soil, today in the Greek Orthodox world is the Feast for St. Conon the Gardener. Um, have we found a method to the madness of when to vote for whom in the first round? We should submit Conon the Gardener and Fiacre next year. Are there others? I have veneration for St. Fiacre, too! Prayer is a labor of love, but still, I voted for the Gardener. Phocas truly understood the meaning of Jesus’ love and COMPOST! Had to go with him. Sue, you made me chuckle!! And swayed my vote. This seems to be a case of you say to-ma(long a)-to and someone else says to-mah-to. Both seem to have legends about them that can’t be verified, so which legend reigns supreme? Should be interesting to see the results. With my hands not steady this am, I made a mistake in the voting. They both, however are deserving saints. The picture of Isadore looks so much like a young family member who has also dedicated his life to farming, simple living, and improving the world around him, that I had to vote for Isadore. I am, however, an avid gardener, and will be satisfied whichever way this round works out! I had to go with Isadore. My great grandfather was named Isadore, and he, too, was a farmer. As a gardener, I leaned toward Phocas, but chose Isidore because I preferred his lifelong, steady toil to the choice to die. 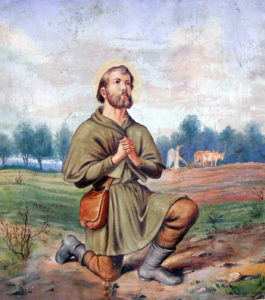 There is a St. Isidore the Farmer Catholic Church in Orange, VA- I’m voting for him! Phocas taught the soldiers two lessons, first the meaning of “love thine enemy” and second the Gospel demand of faithfulness unto death for Christ’s sake. The second was hard for them to learn, though I like to imagine a prolongation of their lives to a point where at least one of them, pondering the death of their benefactor, took up his own cross and followed Christ. Nor should this surprise us, since many of us find that it is hard to be faithful unto death at all times. All that said, I love the mythological and legendary material in the story of Isidore; it reminds me that all language concerning God must in the end base itself in allegory, metaphor, and fable. Phocas dug his own grave, visions of glory with each bite of the spade. I was expecting to vote for Poncas. I read about Isidore. Then Poncas. And it will be Poncas. And Brian will know to whom I refer when I say my vote honors Bonnie the Gardener! I believe you have lost your Phocas there. Phocas: I really need a patron saint for my upcoming attempt at urban gardening in a perfect little spot that came with my house. So far I don’t have a clue how to begin, except at the library. The idea is to learn, have patience and share. Gardeners love to share their knowledge and their bounty. Chat with your new neighbours who will welcome you into your new community. A garden is a wonderful place for meditation and getting your hands dirty. My thoughts and prayers will be with you as I create a new garden too. Perfect! Thanks so much Pip from Canada … from Catherine from Chicagoland. Look for Master Gardeners in your area. They are gracious folks. If you are in the U.S., when at the Library ask a reference librarian if they have any info on your local county extension service &/or master gardener program. Also ask if they know if any community gardens where you can hang out and glean knowledge from other local gardeners. And sometimes locally-owned plant nurseries offer classes too and those people are going to know what grows in you climate/soil. And always try to plant extra to share with those without access to garden space. Thank you for that suggestion. We all frreqwuently don;t know what to do with our surplus when sharing can be very simple. You tube is so great for this. I am an organic nonGMO gardener. Check out MI Garden among the many great free tutorials. No matter what the subnect you can find someone teaching it on the web. They are both so over-the-top. Or under the soil, depending on how you look at it. I voted for Phocas, but hate stories that end that way. I loved Isidore’s lifestyle and mindfulness of the angels all around, but they did play into an unjust society by getting him out of trouble. However…. TOUGH TOUGH TOUGH today. I grew up on a farm and I love to garden and grow things and preserve and cook and all that. It’s morning, a difficult time for me on any day, and I haven’t “put my hand to the plow” yet, so to speak. I’m waiting for one or the other to grow on me more. They’re both so appealing. Thanks for the “grow on me” pun! Wow- another difficult and perplexing choice. My father and gradfather were in the horticulture trade (greenhouse & flower shop) so I relate to the green thumb. After thinking and pondering, I came to vote for the gardener (Phocas); the story of hospitality to his executioners made the difference. I went with Phocas the Gardener. His story reminds me that we have community gardens today and that Michelle Obama’s initiative was healthy eating for children. Both of those are good efforts for the common weal. Isidore’s story is about the enormous economic benefit of serf/sharecropper labor for massive landowners. Wouldn’t the 1% love for armies of angels to work for them for free and increase productivity without pesky unions, health benefits, or retirement packages? There wasn’t much in the miracles I could buy. I could imagine someone tending a garden from which he fed the poor. I could also imagine a corrupt authority seeking to kill someone who gave dignity to the poor. So I kept my “focus” and went with Phocas. Isidore raised someone from the dead! I think that merits my vote. Phocas – what humility, what unremitting hospitality, what an inspiration! I’m thankful to learn of the lives of those who have lived for Christ – we rarely hear of such courage, humility, and generosity together. I’ll go with the angels and choose Isadore. This was a tough one!! Both are wonderful examples of how to live our lives. I chose Phocas because he showed the same compassion for human beings he didn’t really like or have to help. That’s the hardest thing to do! It’s easy to be kind and giving to others you like, love or agree with but it takes a lot to show that same treatment to those we dislike or view as different and not worthy. Thanks Phocas the Gardener for being an example to me as I start my day and will for sure encounter people who rub me the wrong way! Isidore, like Brother Lawrence, found glory in, and praise through common labor in service to others. I have a particular fondness for him. St. Isidor’s was our first parish in Yuba City, California, when my husband was stationed with the Air Force at Beale AFB. It served that agricultural area, the farmers and migrant workers and was a welcoming place for the ‘migrant military,’ as well! I had never heard of him before that time, but he has since grown in my heart. (Pun intended) The collect for St. Isidore is a perfect summary! Isidore had his priorities n order. Nearly an impossible choice today between farmer and gardener. Our church, St, Bede’s in Atlanta, has a vegetable garden on our grounds where we grow summer vegetables for our local food pantry. Voting for the gardener. As I read Isidore’s bio and the beautiful collect, I thought, “Easy! How can anyone top this guy?” Then I read about Phocas and thought, “Oh. That’s how.” Both bios read like otherworldly faerie tales, but both leave me inspired. Another toughie. You sure are putting us through our paces! It’s the farmer in memory of my grandfather. The plowing angel inspired my vote for Isidore. I went with Isidore the farmer because the miraculously replenishing stew pot made me smile. Also, because my mother’s an art historian who has studied early medieval Spain extensively. so today it is Isidore the Farmer. I go with Phocas although the choice was difficult. Phocas’ story seemed more real than legend. I had never heard of St. Isidore until I moved to PA and learned of an RC St Izzy’s parish in northern Bucks County. Interesting to learn of other St. Isidore churches on this thread, also in fittingly agricultural areas. Very hard to choose today! I’m leaning toward Phocas, but I wish his witness of hospitality had converted the soldiers and the story had ended differently. He gave it all he had, though. Very moved by the story of Phocas the Gardner. Also think it more likely to be true. I voted for Phocas because I wish that my fidelity was that strong. Alas, I fear I would fail the test. I had to vote for Isidore. My late father was a devoted Christian and farmer. He faithfully observed the Sabbath with no work in the fields from sundown to sundown – no matter how pressing the planting or harvest. (However, we did milk the cows and feed the chickens!) He taught me so much, especially through his love of the beautiful Iowa farmland. I must go with Phocas, the martyr who showed hospitality to his own executioners. But I do appreciate the lesson of Isidore’s life regarding the holiness of hard work. I loved Anna’s words about Isadore – that he modeled that “dignity and holiness can be found in the ordinary life”. But in our country right now, when we are so separated, Phocas’ ability to serve his enemy, proclaim his faith. was most compelling. I wonder if I could be so gracious to an ICE employee or even my relatives who are great supporters of _______. We all have such relatives. It makes family gatherings very difficult; constant prayer for patience and for the kingdom to be made apparent to all is necessary. It also helps to keep the car keys at hand in case one needs to leave. Lovely to see your name, Ellen! I remember you from the early days of VTP in Atlanta and at Candler in the early 90’s. New last name now for me, but lots of memories of those days. I hope you’re well and happy. I share your thoughts on these two. Not sure yet who I will vote for, but leaning toward Phocas. San Isidro el labrador quita el agua y pon el sol (Saint Isidore the farmer, take away the rain and bring back the sun). We used to say all the time as children when we wanted to play outside and was raining. Thank you. It was. And it reminded me the tropical rain in the summer afternoons in my hometown when I was a child. It also reminded me my grandma who was afraid of thunders. She sat in her room with her rosary in the hands during the rain. Good memories from the past. I know how backbreaking heavy agriculture is. I like Isidore because he remained faithful to his employer, as well as serving others. I’m a gardener like Phocas but I figure that perhaps by giving Isidore my vote I can get an angel or two to help with my weeding and such. Isidore was also a tenant farmer like my grandfather, who despite his many flaws, inspires my love of growing food. Isadore’s story was way too incredible. So, even though Izzy probably has better kitsch, my vote goes to the hospitable gardener. My father’s middle name was Isidore and my wedding anniversary is May 15 so my choice was made for me this morning. I am home from work today and looking out the window at our freshly planted garden. Here in Texas, it is early spring. My wife and daughter are the earth angels who planted our garden and so for that reason I voted for Isidore. Isadore was a “shu-in”(however spelled) until I read that Phocas not only extended great hospitality to the soldiers who were looking to kill him but dug his own grave in the midst of his beloved garden, and then insisted that the soldiers carry out their orders!!! Sorry Isadore, but my focus shifted. Shouldn’t that be “my phocas shifted”? I no longer chalk off miracle stories as fables, legends or lore. I like miracles and angels and mystery. These are two good saints. After pondering the messages, I’ve realized the pattern that’s emerged through the madness, is prayer–particularly fasting prayers, the power of prayer, and my awe of miracles–even absolutely outrageous miracles. Now, this isn’t a new thing to me. I’ve long been concerned that we have lost the art of praying and don’t know how powerful praying can be. We’ve lost our confidence, our boldness and our expectation of results. I voted for Isidore for a hundred reasons, but mostly because I like simple prayers–go check that pot. Also there’s rumors of 438 miracles. I went with Phocas who accepted the inevitable. I also wonder about the soldiers who were forced to their deed against their will. Also, NOTE to the SEC: It’s ARCATA, California. All honor to gardeners of flowers, fruits, and vegetables, and may my late beloved elder godmother rest in peace and rise in glory with all heavenly gardeners. I voted for Phocas because of the historicity of his life story. Nevertheless, without gardens our planet would be a moonscape, so thanks be to God for all green thumbs. About Isidore, I particularly like this quotation in his bio: “Through Isidore’s witness, we see that real abundance is not found through monetary wealth; dignity and holiness can be discovered in an ordinary life dedicated to God. Through our labors, we can also find a relationship with God as the toil of our hands takes care of our fellow humans.” Philanthropy of the monetary kind is a very good thing, but the solution to problems isn’t always money. Time, attention, prayer – love in action, in other words – can be like the ripples in a pond, doing good in ways and to the extent that we cannot imagine. My late godmother lived such a life, and her expertise in the garden and at the sewing machine, plus her loving and generous spirit, gave her life a loaves and fishes quality. That’s the nature of grace, which Isidore and Phocas received from God and passed on to the the benefit of others. I voted for Isadore. It is my own failing but I could not vote for anybody who would extend hospitality to those who have come to kill me. I’d find it really, really, really hard to do all this stuff for you and dig my own grave and then say: “Well, come on and get my beheading underway and bury me six feet under ! Cheerio!” Guess I’m really lacking in the true meaning of servanthood of the selfless kind….but it is LENTMADNESS…right? Have to go with Isidore as he is witnessed in stain glass at All Saints Chapel outside Elkhart Wisconsin. The grounds around the Chapel were commemorated in his name. The Chapel sits adjacent to vast farm fields. There is an aura around the Chapel that in part could be the presence of St. Isidore? I voted for Phocas. I love gardening and sharing my abundance. Allow a little paraphrasing…from the dirt we came and to the dirt we return. Phocas for me, he gave his all to the garden. Another difficult choice. There is little doubt that both men had admirable qualities when I came to sharing the love of Jesus or the Lord. However, for some reason, Isidore won me over right away. I think it’s because I grew up with so many family friends who farm or farmed that Ilove farming and farms, and have so much respect for those who do such back-breaking work. I also loved, loved, loved his collect. Phocas the gardener. His story reminded me of a family story about how, during the Great Depression, my grandfather raised a large garden and shared produce with his neighbors. This was a very, very tough decision. I decided to read through all the comments before I made up my mind. Thank you, everyone, for your thoughts on these two worthy candidates! In honor of my friend and fellow DOK, Becky and all those at Our Saviour Episcopal, Dallas who work to run, maintain, & manage the Our Saviour Community Garden & its Plot Against Hunger in their Lowe income outer Southern Dallas neighbourhood of Pleasant Grove, I cast my vote for Phocas, who shared his food and even his lodging with all, even those who would ultimately . . . I was going to say take his life then it occurred to me that they didn’t take it, Phocas gave his life rather than deny the One who had already given His life for him. low-ncome not Lowe income . . . bleeping auto-co-wreck . . . LentMadness Comments need an edit button even worse than Twitter does. And here I thought Lowe Income was such a COOL and punny name. Thank you — glad to be back. My housemate and I had a great week in Georgia at a seminar with our favorite biblical archeaologist. . Got back in time to see the snow blow horizontally all day Friday. Isidore the Farmer’s bio read more like “legend has it”; whereas, Phocas the Gardener’s story seems rooted in factual history. My vote is for Phocas. I go for Phocas. His story is simply. He had simple faith in a time when simple faith was needed. He preached with what he had. A really tough choice! For the first time this year, I looked at the results before I voted, and chose the current underdog. Both deserve to win. My initial thought was toward Phocas the gardener, because I too aspire to having a garden to be used toward helping our homeless and needy. So I read about Isadore the Farmer with an open heart seeking to change my mind………..
As it happens, I resonant deeply with Phocas. And I resonate with his standing in the truth and integrity of his relationship to God, and continuing to testify to Jesus. He is the kind of saint, I would wish to emulate. If I were placed into the same position as he, I hope that my response would be similar. Tough match up, but I sided with Phocas. Stories of generosity, even to enemies, always make me think and consider the “what if’s” about the world. To those who work by acres, not hours, we thank you. My vote went to Isadore, due to the generations of farmers in both branches of my family. I like Isidore because he worked over 400 miracles. After the first few rounds of heavy hitters we are getting into the weird but wonderful stories of unfamiliar saintly people. I’m absolutely loving reading about persons previously unknown to me. Today I focus on Phocus. You say Phocas was first century yet the Diocletion persecution was the turn if the FOURTH century. Need to be a bit more vigilant. Riverhead NY has a St Isidore’s Church. Polish farmers settled in area. Gives meaning to the name. I like that prayer came before labor, setting the tone for the day. Accidentally voted twice. Didn’t lock out like normal. Still allowing me to vote. Should I vote for Isidore to cancel out my extra Phocas vote? Actually feel a little guilty. Although I love to garden, the Parable of the Sower & the Seed is one of the passages that speaks most deeply to my heart. Had to go with Isadore; doubtless he encountered many situations during a long haul as a farmer. I (foolishly!) read the bios on Friday, which meant that I had the entire weekend in which to change my mind more than 400 times. Today, I decided that a thorough reading off all of the comments from my wise fellow travelers would surely provide me with a pathway to the most deserving candidate… Thank you all from the bottom of my heart for your well-defined and nuanced assistance! I now realize that I must pray a bit longer and perhaps simply flip a coin and leave it to chsnce! AARRGH! What a dilemma! My father grew up on a farm, and I’ve always known lots of farmers even though I’m a child of the suburbs. I’m an organic vegetable gardener who shares a lot of produce with friends, neighbors and anyone who will consent to take a zucchini or two off my hands. I guess I’ll go with Phocas. If Phocas was martyred during the Diocletian persecution, presumably he lived during the late 3rd and early 4th centuries, NOT during the first century, as our blogger states at the outset of his write-up. Though much in the stories of the early saints is often based on popular legend, I wish our bloggers would at least take the trouble not to be careless and to try to get straight whatever facts and dates there actually are in these stories. That whole Diocletian thing! Undoubtedly he was a bad guy, but the Christians didn’t come out looking so good either after defacing lovely artworks in his palace. Just one of many precursors to our current polarization, it gives me perspective when I think our 21st century problems are a new low in civilization. The centuries of difference between Diocletian and Phocas is puzzling. But the Lent Madness writer is certainly not alone in confusion, it seems to be rampant in the Internet machine. As an only child, I was expected to learn and do chores usually done by boys as well as girls. I don’t really like gardening very much, but I do love watching plants grow. I had trouble deciding, but finally am going with Isadore, who prayed first, then labored, and shared the bounty given by God and the angels with those who needed it. Has Oliver not weighed in yet? Voting for Isidore although it was a tough choice. I grew up on a small farm in the west and my dad worked very hard to grow vegetables that he could sell to neighbors. When I think how pleased he would have been (and not necessarily surprised) to have angels plow his fields, I had to go with Isidore. It was difficult for the disciples to remain with Jesus through his trials. It is even more difficult for us. Phocus did the opposite and chose o join Jesus in death. I am glad to get to know these saints. I went for Phocas with hospitality that was a witness to the Gospel. These two people exemplify the same idea. Coming from farming stock (think 10,000 white leghorns) and gardening stock (brother’s garden had to be seen to be believed), in the end I had to go for the farmer who kept the home fires burning while feeding workers during World War II. Isidore the Farmer reminds me of Theodore my Father. I voted for Phocas because of his powerful witness, but I’ve always had a soft spot for Isidore. I grew up in the Southwest, where there is a great devotion to San Ysidro. Such a tough choice! But as the Chair of our Flower/Garden Committee at The Church of the Presidents in Quincy MA aka United First Parish Church (Unitarian Universalist), I will have to vote for Phocas. It inspires me to research the protocols/zoning rules for our members to bury their ashes in our church gardens. I spend so many happy hours there already! If Isadore is good enough for the angels, he gets my vote. In honor of St. Isidore Episcopal Mission of The Woodlands, TX, and the Abundant Harvest Food Truck which in being #offensivelygenerous in their less than two years of existence have washed and dried over 12,630 loads of laundry, served over 17,475 meals, and shared over 78,500 pounds of food while being I cast my vote for St. Isidore. Re:Phocas, I genuinely loved his story, but at its ending found myself thinking of a learning and teaching of the early church, when they had to explain to young people rushing to be martyred, that martyrdom was not something to be actively sought…. that is might occur, but the path was to live if possible. St.Thomas More… the “man for all seasons” makes that same point in the play of that name, when his jailers bring him repeated papers to sign…. trying to trap him… and he says in essence, that if he can find a way to sign with integrity, he will… because his duty is to live for the Lord… but if he can’t sign with integrity, then he will likewise accept the necessity of his death. “Live if possible.” That sounds like a sound and healthy duty for a creature of God. I second it. I voted for Phocas because (at least from the material in the accounts provided on this site) his story was not all inflated by the sort of legendary miracles that set up saintly heroes as so favored by magical powers that there’s little left for us ordinary folks to emulate. Stories of saints like the account of Isidore here, posit a world where good people get all kinds of help from angels and from God himself, while the evil and ill-intentioned, or just the people who challenge Our Hero, get humiliated or punished. That’s not what the world is really like, so, again, it’s hard to see such saints as models for our lives. Rather, they seem like mascot-like heroes that just lead us to say YAY OUR TEAM. Phocas’s Wikipedia article reveals that at the moment of his martyrdom the sky turned to gold and the words “ALL RIGHT” miraculously appeared in the heavens. For what further sign could one ask? Hocus pocus, I’m for Phocas! This totallly cracked me up! Thank you! Phocas’s story made me cry!! He gets my vote!! 400 Miracles is pretty darn impressive. As much as I love gardening, the Farmer’s got my vote. Anyone who gives away so much produce to the poor that the authorities want to kill him has my vote. Thats a lot of ‘taters and ‘maters! Hurrah for Phocas! I was all set to vote for Isidore until I read about Phocas. Wow! What sacrifice!! That is what Lent is all about! Phocas got my vote! I missed the voting, but would have voted for Isidore, the farmer. My father was a dairy farmer. I spent many summers helping. It was a wonderful experience.